The Marvel Cinematic Universe has realigned how Hollywood thinks of blockbusters, franchises, and comic book movies. Though the films have been groundbreaking at the box office, it's been nine years since Marvel Studios began the MCU and they're still two years away from having a solo female led movie on our screens. But if Thor: Ragnarok's Tessa Thompson has anything to do with it, that's not going to stand. During a recent press conference for Taika Waititi's much anticipated Thor film, Thompson regaled us with a rad story about confronting Kevin Feige with the possibility of an all-female Marvel movie. "Recently I marched up with a couple other women in Marvel and were like, to Kevin, 'what if there was a movie with some female superheroes?...like all of them?'" Thompson explained. According to Feige, Tessa's dream could become a reality. "It's a pretty amazing moment to be somewhere and have your shoulder get tapped and every female hero we have is standing there going, 'How 'bout it?' And I said, 'Yes,'" recounted the head of Marvel Studios. So if Feige says it's (maybe) happening, then what would that movie look like? Once again, the hero none of us deserve came to our rescue. "There's a precedent for it in the comics, right? With the Lady Liberators," Thompson responded, giving hope to female comic fans everywhere. But who are the Lady Liberators and how could they come to life on the big screen? Who Are the Lady Liberators? First appearing Avengers #83, this all-female team was originally written by Roy Thomas as a way to mock the burgeoning feminist movement. But as with any misguided bigotry, it ended up showcasing exactly how wonderful its targets were, unintentionally becoming a cult hit filled with incredible panels featuring Marvel's most famous female superheroes spouting radical politics and demanding an end to the patriarchy. 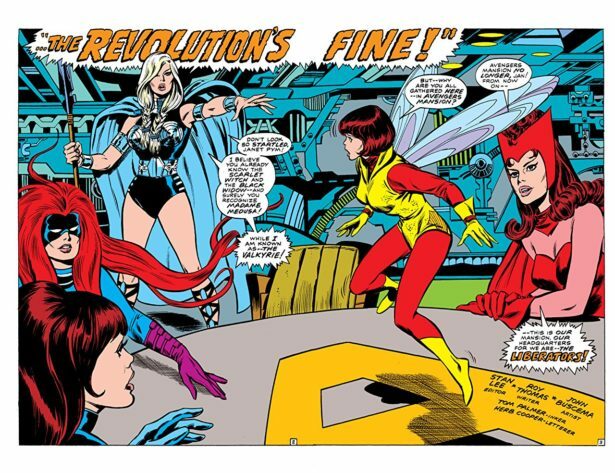 Drawn by John Buscema, the one-issue team-up consisted of Valkyrie, Black Widow, Scarlet Witch, Wasp, and Medusa. Unsurprisingly, Thomas couldn't imagine a black woman on the team. But now with Tessa Thompson's portrayal of Valkyrie, we have the potential for a rad super-powered girl gang led by a radical black woman. In the 1970 issue, the Lady Liberators attempt to smash the patriarchy by beating up a lot of bad guys and fighting the Avengers, but in a cop-out reveal it turns out the Lady Liberators are actually being mind controlled by a villain. Who cares! MCU movies rarely stick to canon and this could be a fantastic starting point for a brand new set of lady-centric Marvel films, especially since every member of the team exists in some way in Marvel's live action adaptations. Created by Roy Thomas and John Buscema as a guise for the evil Enchantress, Valkyrie's first appearance was as the radical leader of the Lady Liberators, but she didn't become a regular recurring character until Defenders #4. A chosen warrior of Odin, Valkyrie A.K.A. Brunnhilde was picked to lead the Valkyrior to take fallen Asgardian soldiers to the afterlife. Though not immortal, Valkyrie ages far slower than humans and is one of the most powerful Asgardians to ever live. Carrying an enchanted sword named Dragonfang and riding a winged horse named Aragorn, she can also transport herself and others between the realms of the living and the dead. Valkyrie has been a part of numerous teams including the Defenders, Secret Avengers, and Doctor Doom's Avengers in AXIS. Probably the most well known of all of the potential Lady Liberators due to her prominence in the MCU, Natasha Romanov was trained from her birth in 1928 to be an assassin in Stalingrad era Russia. Originally introduced as an antagonist to Iron Man in Tales of Suspense #52, Natasha is one of the longest running female characters in the Marvel canon. She has been a member of both S.H.I.E.L.D. and the Avengers, and her power set is based around her spy training, agility, and speed. Proficient in numerous martial arts, she's also been bioengineered to age slower and repress her traumatic memories. Magneto's on-again off-again daughter Wanda Maximoff is one of the most powerful (sometimes) mutants who's ever lived. Raised by a genetically engineered cow called Bova along with her brother Quicksilver, Wanda has one of the most eclectic and exciting origins in comics. Introduced in X-Men #4, she was created by Stan Lee and Jack Kirby, originally a macguffin with undefined powers who could push along the plot as needed. But now we know she's a powerful magician with the ability to manipulate chaos magic and change the fabric of reality itself. One of the original founders of the Avengers, Janet van Dyne also came up with the iconic moniker that now defines the most famous superhero team on earth. 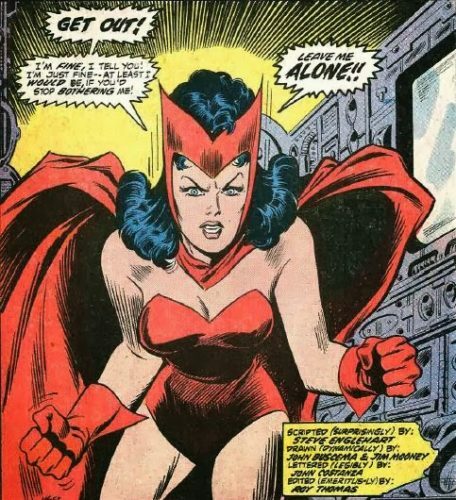 Janet first appeared in Tales to Astonish #44 and went on to lead the team from Avengers v1 #217. Wasp's suit uses Pym Particles, so her powers are very similar to Ant-Man's, allowing her to change her size and when miniature she grows a pair of genetically modified wings that allow her to fly. Though the movie version of Wasp is actually Janet and Hank's daughter, Hope van Dyne, we're expecting to see Janet return to the screen in next year's Ant-Man follow-up. The only member of Lady Liberators not appearing in the MCU, Attilan Queen Medusa is part of the Inhumans, a ruling class of advanced prehistoric humans who live on the Moon. They have similar powers to mutants except Inhuman abilities are defined by DNA and triggered by a strange "Terrigen Mist." First appearing in Fantastic Four #36 as a member of the villainous Frightful Four, Medusa and her family were only in 50 issues over 50 years until Marvel decided to try and relaunch the series in the 2010s. Medusa's famous power is her prehensile hair, which you likely saw come to life on ABC's recent bad CGI wig show, The Inhumans. We can't wait to see if this dream team comes to life, but how about you? Are you stoked to see these rad women join forces? Just excited to see Tessa Thompson return as Valkyrie? Let us know in the comments! Stan Lee stands up for diversity and representation. Thor: Ragnarok impressions hint at another winner. Hawkeye to star in Old Man Logan prequel.